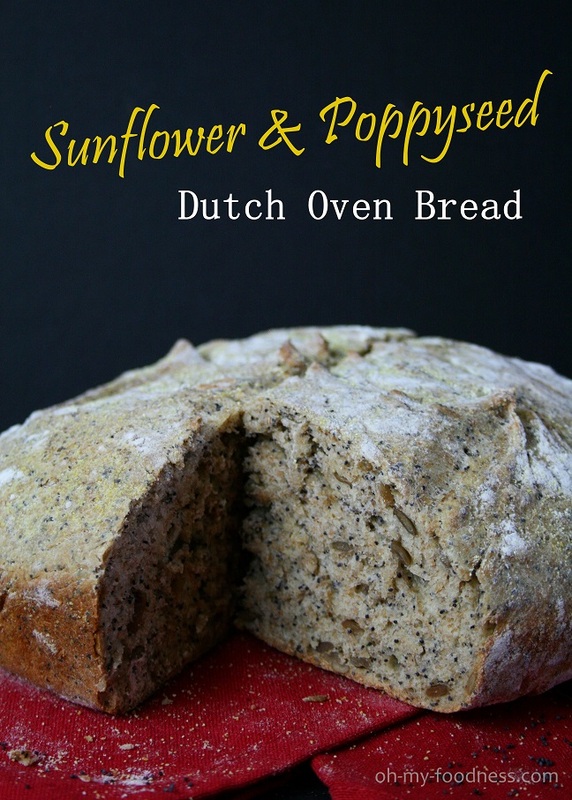 Sunflower & Poppyseed Dutch Oven Bread | Oh My Foodness! Before we moved to Los Angeles from Tennessee in October 2014, Cobalt and I had to minimize our packing drastically in order to avoid using a moving van (we succeeded, praise God!). Some of the things we gave away or sold were even gifts from our wedding two years prior. I was a little sad but knew this stuff was just stuff and we could eventually rebuy them, if necessary. One of the items I was hesitant to be separated from was my cast iron, which had just become legitimately seasoned. But last Christmas, Cobalt was so kind to replace them by buying me both a skillet and a Dutch oven. My heart was so happy when opening that uber heavy Amazon box! And to this day they are my favorite kitchen item. I love their versatility! Over the last year, I’ve regularly used the skillet but have had trouble figuring out what to use the Dutch oven for besides whole chickens and soups (a lot of soups I throw in crockpots, though). So the other day I looked up uses for these cast iron pots and found a recipe for Dutch Oven Bread. While skimming the recipe, I realized in a “duh” kind of eureka moment that Dutch ovens essentially mimic stone ovens; therefore, they are the perfect fit for breads that need rising. So I gave this recipe a go and oh-my-goodness-gracious! I can’t believe I haven’t been making bread like this. Seriously, I’ve been trying to get bread right for YEARS (as in a good crust and overall texture) and this method is essentially fool-proof. First, I tried the original recipe without veering one bit. It’s a white bread that essentially tastes like sourdough without the sourness. The crust is thick and crunchy, the inside spongy and soft. This version makes an excellent cheesy, egg sandwich or a carb companion to soup. To change things up a bit, I added my own flair. I find that wheat breads are more flavorful and, quite honestly, sit better in my stomach than white bread. I also love nutty breads. 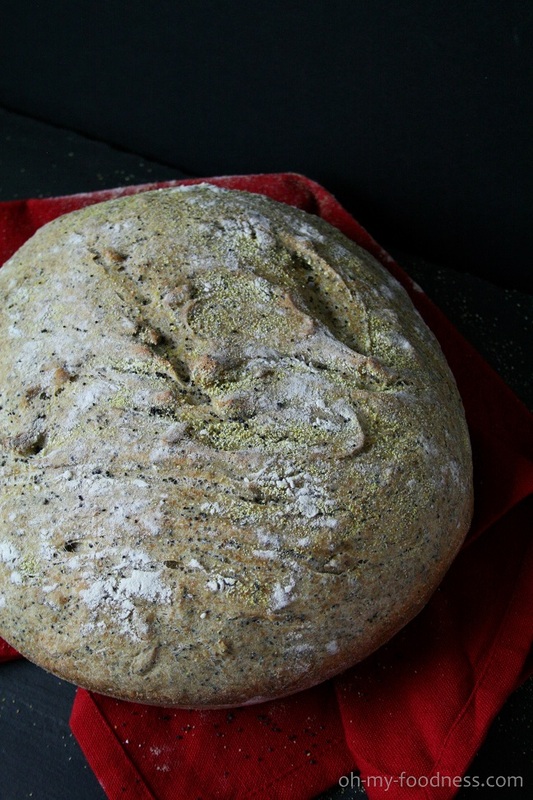 So I made a sunflower, poppyseed wheat bread, recipe below. This version was absolutely perfect. Always disappointed with the density and thin crust of wheat bread, I was pleasantly surprised when this one was baked crispy and soft! P.S. #1 I thought 1 TBS salt was too much but it’s perfect; so don’t be scared by this much salt. #2 I used cornflour + flour to dust my Dutch oven so the bread wasn’t so chalky after baking. Here’s the recipe for you! Crunchy crust, soft, spongy inside. Perfect for toasting and spreading with butter, cheese or meats! Whisk together 3 cups of flour with flaxseed, poppyseeds, sunflower seeds and salt. Make a well in the center of the bowl and pour in the warm water. Sprinkle yeast over water as well as sugar and oil. Gradually add the rest of the flour, 1/4 cup at a time. What you're looking for is a ball-like dough that's still a little sticky. Pour out your dough onto a floured surface and sprinkle flour over the top. Fold the edges of the dough inside itself until the dough isn't so sticky anymore (so it's a rough knead for 3-4 minutes). Then turn the ball upside-down. Place the ball, seamside down, in a bowl that has been greased lightly with olive oil; grease the top of the dough, too, by flipping the dough a couple times. 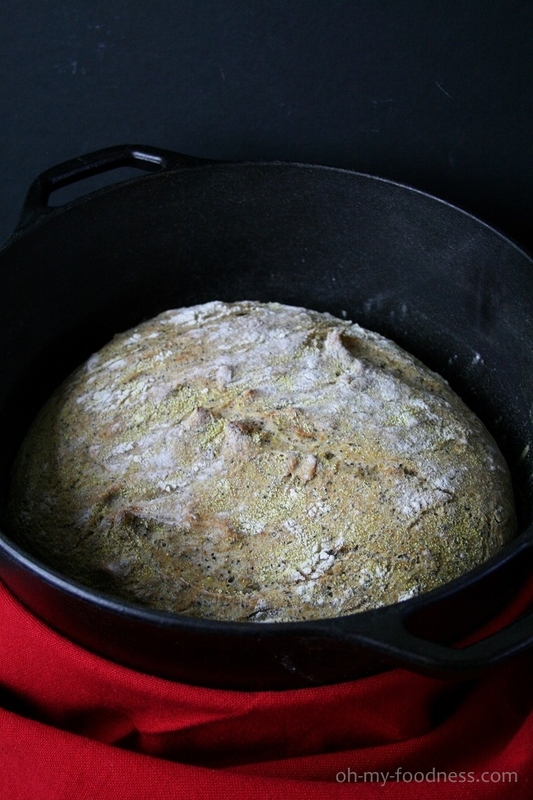 30 minutes before baking your bread, preheat the oven to 400F and place your Dutch oven inside to preheat. CAREFULLY take out your Dutch oven (it will be supahhh hot!) and dust the bottom with flour. Gently plop your risen dough inside (you don't want it to deflate too much) and sprinkle the top of the dough with flour, too (alternatively you could use cornmeal). Score the top of the dough with a knife or razor blade. Bake for 30 minutes with lid on and then take off the lid and allow bread to brown for another 10-15 minutes. Using heavy duty oven mitts, remove Dutch oven from your oven and tip the bread onto a cooling rack. Let bread cool at least 15 minutes before slicing. 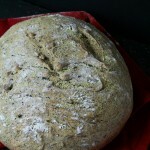 This entry was posted in "How To"s, Breads & Muffins, Recipes. Bookmark the permalink. This looks really yummy! I don’t have a cast iron dutch over…. any thoughts? Also – I assume you mean whole wheat flour when you mention ‘wheat bread’ in your text? AND – as you know, I don’t use oils…. is this just for moistness and could I replace with something like blended avocado? Thoughts? Actually I did make this with half what and half white flour – thanks for pointing that out – I’ll fix it in the recipe … No, you don’t need the oil, it’s just for moistness – you can keep it out. :) Also, you don’t HAVE to use a dutch oven. You can use a loaf pan instead. Just bake it for a shorter time. And the texture of the bread will be a little different since the air isn’t trapped. If you have an oven proof pot though you can use that!